This delightful dessert is suitable for any occasion and will definitely satisfy your sweet tooth. A lovely way to end your dinner or lunch, our cream cheese dessert combines delicious ingredients in a beautiful way. It is the perfect dessert for low carbers and healthy eaters. The abundance of fresh fruit combined with cream cheese and whipped cream is a match made in heaven. A definite must try and no guilt. This is a festive treat for your family dinner, party, barbecue, or picnic. Serve at tea time to impress your friends. Prepare the strawberry syrup first. Simmer water, strawberries, and 1 tablespoon of sugar substitute for 10 - 15 minutes. Cool and strain to separate the syrup from the strawberries and set aside. Use a fork to break the cream cheese or process it in the food processor. Remove any liquid from the yogurt, transfer to a medium bowl, and combine it with the cream cheese. Add the strawberry syrup and lemon zest, combine well, and mix with the mixer until creamy and well blended. 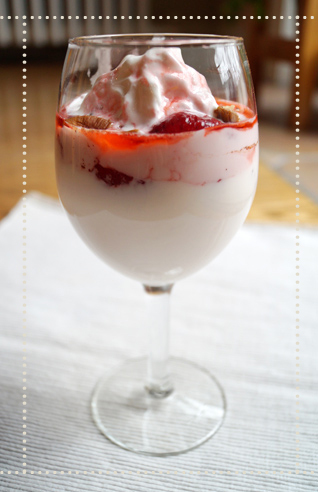 Distribute half of the cream among 4 glasses or bowls, add strawberries, and then add the remaining lemon cream. Garnish with whipped cream and top with blueberries. Refrigerate for 4 - 6 hours to cool and serve with low-carb cookies.